Jean-Henri Riesener created many of his best pieces for Queen Marie-Antoinette of France. 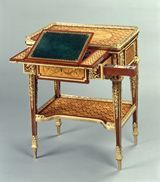 This exquisite writing table was supplied in 1782 for the Queen's 'boudoir de la M�ridienne' at Versailles, and has marquetry and realistic, jewel-like mounts of the very highest quality. The gilding alone, by Remond, cost 1,050 livres. An inventory mark records that the piece was subsequently in the Petit Trianon. During the last years of the 10th Duke of Hamilton's life, the writing table was definitely in the Duchess's Sitting Room, along with the secretaire and commode now in the Frick Collection. Marie-Antoinette's table fetched �6,000 - a very high sum - at the 1882 Hamilton Palace sale and is now at Waddesdon Manor, near Aylesbury.